With the introduction of AirPlay and Home Sharing support for iOS devices, streaming audio and video between your various computing devices is getting a fair measure of Apple’s attention. Whereas in the past you could stream audio from your iTunes library to an AirPort Express Base Station, Apple TV, or another Mac, iTunes can now stream audio and video to compatible iOS devices running iOS 4.3 or later, and those same iOS devices can stream their video to an Apple TV or other AirPlay-compatible device. But what about content that isn’t contained in your Mac’s iTunes library? For that, there’s Rogue Amoeba’s $25 Airfoil for Mac. New in Airfoil 4 is the capability to control playback for some audio sources (Apple's iTunes and QuickTime Player and Rogue Amoeba's Pulsar among them) from within the Airfoil Speakers application; the display of metadata within this same application; and the capability to watch, within Airfoil Video Player, video from streaming sites including YouTube, Hulu, and Netflix. My colleague Dan Frakes admirably explained Airfoil’s intimate details a few years back in his review of Airfoil 3.1. Rather than regurgitate his words, allow me to sum up how Airfoil works and address version 4’s new features, confident that you’ll read Dan’s review for more information about previously existing features. Launch Airfoil and you’ll see a list of all Airfoil-compatible devices available on your local network, including computers and iOS devices currently running Airfoil Speakers or Airfoil Speakers Touch, respectively. 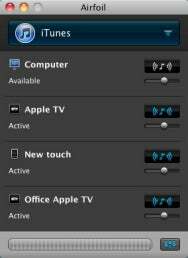 (As with AirPlay in iTunes, this list also includes the host computer.) Select those devices you wish to send audio to and, if you like, adjust the volume for each device separately. From a pop-up menu at the top of the Airfoil window, choose a source—iTunes, Safari, QuickTime Player, or another application of your choosing (including Airfoil Video Player if you want to stream a video’s audio—as with Airfoil 3.1, you have to enable at least one destination before Airfoil Video Player streaming will work). Start the source playing and the audio streams to the enabled devices. Instead of audio from a specific application, you can select one of your computer’s audio sources—your Mac’s built-in analog or digital audio inputs, for example. This is a compelling feature if configured correctly. For example, I have the digital output of a Sonos ZonePlayer 90 (part of the Sonos Multi-Room Music System) plugged into my Mac Pro’s digital audio input. When I choose that digital input as a source, I can then stream the Sonos’ music to my iPod touch running Airfoil Speakers Touch, effectively giving me a portable Sonos player that I can carry in my pocket—and control via Sonos's own app. Granted, it’s an oddball setup and works only when I’m within range of my home Wi-Fi network, but it shows how flexible Airfoil can be. The capability to play Web video via the Airfoil Video Player, streaming that video's audio to remote devices, is also welcome, but it requires a lot of processing power and this is reflected in the quality of the video stream. I watched several video clips on both Hulu and Netflix and found that while the audio playing through my office Apple TV 2 and the video displayed on my MacPro’s screen played in sync (something of a minor miracle in itself), the video wasn’t as smooth as it was when I viewed the same content in my Web browser—dropped frames were noticeable. I contacted Rogue Amoeba about this, and the company said that the faster your Mac’s processor, the better Airfoil Video Player performs. My 15-inch MacBook Pro (2.66GHz i7 processor) is the fastest Mac I own, and the dropped frames were still evident. The video is quite watchable, but it’s something that some people are likely to notice, particularly on slower Macs. 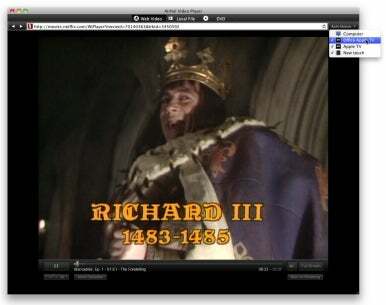 Airfoil Video Player’s less-than-perfect playback aside, Airfoil for Mac remains a solid and unique utility. It's a very clever and affordable way to stream all of your Mac’s audio throughout your home and to your iOS devices.